*Special Order* - Dried cranberry, blackcurrant, white pepper and the typical intensity of violets on the nose with loads of dark fruit dominates the palate. The nose offers cinnamon, nutmeg and cloves with an abundance of dark plums and violets with hints of white pepper and dark chocolate. 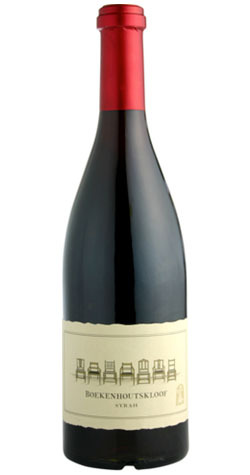 The attack on the palate is rich, generous and intense with the sweet spices and dark berry fruit following through. The wine is exceptionally smooth and balanced with perfectly integrated acidity and mouth-filling, svelte tannins adding to the fine structure. The finish is long with great fruit purity. The Boekenhoutskloof Syrah fruit has been sourced from a specific site in Wellington since 1998, because of the unmistakable character that the decomposed granite exhibits. The SH-21 clone was planted on this SE-facing slope in 1993 to maximize the cooling effect of the prevailing easterly wind. In 2012 the fruit was harvested over a period of eight days starting on February 27th. The complexity of this wine also benefits from the diversity in grape maturity from the five different picks. The fruit is kept in the cold room overnight before it gets sorted and crushed into concrete fermenters. A small percentage of whole bunches were put into the bottom of the tank of some batches to get a slight effect of carbonic maceration. After 4 days of cold soaking, the fermentation starts by only using native yeasts. The primary fermentation is done within two and a half weeks with the temperature that peaks at around 28-29°C. During the fermentation the wine gets a delestage 2 – 3 times per day. Pigeage is rarely done on the Syrah. It also received a post-fermentation maceration for another week before being pressed to 2nd filled Saury barrels to undergo MLF. After 18 months in barrel the wine gets a light egg-white fining before its final 8 months in oak. A quarter of the blend was matured in an older 2500L French oak foudre for the final 8 months. In 1993, a group of enthusiasts purchased a farmsteadnear the town of Franschhoek, that had been founded in 1776. The group painstakingly replanted the vineyards and restored the property, and built a new winery. The farmstead was called Boekenhoutskloof. The winery is committed to innovation in pursuit of quality, and to this end they have a much more modern regime than many of their neighbors. The winery has gone from one success to another.